The much heralded partnership of Anderson/Stolt, featuring Prog Icon Jon Anderson (Yes) and Roine Stolt (The Flower Kings) resulted in the release of the critically acclaimed album ‘Invention of Knowledge’ earlier this year. The album marked the return of Jon Anderson to the sound he created with the legendary group Yes. InsideOut is pleased to announce that the album has also been submitted for consideration in the following categories for the 59th Grammy Awards. Nominations will be announced Dec 6th. Swedish Prog Legends Kaipa DaCapo Feat. Guitar Icon Roine Stolt To Release First New Studio Album In 35 Years – “Dårskapens Monotoni”! Sweden – Prog dreams do come true! Legendary ’70s Swedish Prog ensemble Kaipa DaCapo featuring guitarist Roine Stolt will be releasing a new album “Dårskapens Monotoni” on October 10th on Foxtrot Records! In the mid 70’s the band Kaipa was one of the main acts on the Swedish music scene, alongside groups like Kebnekaise, Samla Mammas Manna, Hoola Bandoola, Bo Hansson, Made in Sweden. Four young men devoted all their time to the band Kaipa, with regular touring and recordings between the years 1974-1978. Kaipa did many shows, over 100 each year and many live broadcasts on national radio and television. They recorded 3 albums for the DECCA label and were often compared to international contemporary giants of the genre, like Genesis, YES, Pink Floyd and Focus. Three of the original members have now re-united and play the music from the most popular albums from their 1970’s catalogue, now together with two new younger members – trying to be faithful to the vibe and sound and 70’s style. Ingemar Bergman, Tomas Eriksson and Roine Stolt carry the torch forward from the 70’s – Roine, perhaps the most well know now within progressive circles – with recent success with his own bands “Transatlantic” & “The Flower Kings” – with almost one million albums sold. Lately also as a member of Steve Hackett’s touring band and most notably on a brand new successful collaboration with Jon Anderson of YES – “Invention of Knowledge” – released June this year to thunderous reviews. The duo are working on a follow up to that album – with possible live shows of Anderson & Stolt Orchestra in 2017. June 2016 saw Kaipa DaCapo record brand new material for the first time in more than 35 years. This is the first full length album with new Kaipa DaCapo music from these gentlemen – recorded in a state of the art studio in a very organic and old fashion way – 5 guys playing the music together in a recording studio. Journey with Agents of Mercy to Dark and Dramatic Places! 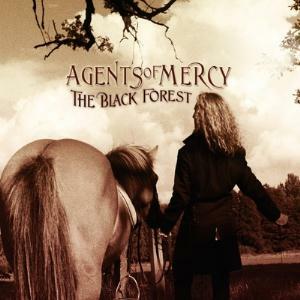 Agents of Mercy was formed in 2009 by guitarist Roine Stolt and singer Nad Sylvan. The two core songwriters have cultivated their sound with different musicians over the course of three Agents of Mercy albums. Their latest, The Black Forest is filled with dark imagery and dramatic instrumentation. The eight tracks follow a rock oriented path yet twist and turn through ethno, folk, jazz, medieval, prog and symphonic stylings. Guitars and drums lead the way but mellotrons and moogs add to the mystery of the music. The album was recorded at a top notch studio in Sweden at Varnhem, which is described as very “dark age”. The combination of modern and medieval enhances the mood of the music. The album was recorded on analogue tapes that also adds to its aura. There is a lot of tales and terrains in The Black Forest. I found that I enjoyed the material more upon multiple listens as there are a lot of subtle sounds placed in its prog rock path. Of particular note is the eerie and electrifying “Citadel” inspired by the legend of the Blood Queen – a serial killer that lived from 1560-1614, followed by the more encouraging message of “Between Sun & Moon”. The CD closes on a reflective note with the intricate instrumental ” Kingdom of Heaven “. Journey with the Agents of Mercy to dark and dramatic places! Roine Stolt (The Flower Kings, Transatlantic) explains his passion & influences. Gaining his first taste of prog fame with Swedish outfit Kaipa in 1974, Roine Stolt is best known today as the mastermind behind The Flower Kings and the lead guitarist for prog rock supergroup, Transatlantic. Recently, Roine completed the third album with Agents of Mercy, and I recently spoke with him about his projects and inspirations. Agents of Mercy recently toured with District 97 and Sky Architect (two phenomenal bands, by the way). How did that come together and how did the tour go? We played just 2 gigs with Sky Architect; one of them just happened to be in Canada at a festival and the other one was a gig in Holland, where I specifically asked to have them as our “support band” when we played with Agents Of Mercy. District 97 is a new American band I’ve followed since their debut, Hybrid Child. We did a short tour in the USA together last May and it all started with the idea of having them as a support act at a show we did in New England. After hooking up with Jonathan (their drummer), we both just tried to fill in with some more gigs and came up with a short tour together. We all have lots of fun; they are a talented bunch and have a great “front [wo]man” in Leslie Hunt. How did the Agents of Mercy project come together? It all started when I did The Fading Ghosts Of Twilight and invited Nad Sylvan to sing. That’s the axis upon what AoM as a band spins today. Jonas Reingold was already on the 1st album and after we did a joint venture tour with his Karmakanic band in 2009, Lalle Larsson came in as a keyboardist. In turn, he brought in his friend and drummer Walle Wahlgren just in time for our 2nd album recording, Dramarama, in spring of 2010. So when we got together to record the 2nd album, we all felt that the chemistry was right and that we enjoyed to play together, as well as have talks about music, life and philosophy. We had many good laughs together, and if a band can laugh, it has a good chance to stay together. All of them are very genuine musicians. This is your third album with them. How does this one differ from the previous two? I’ve read that it began with the intention of having a low key, acoustic style. No, it was in fact the first album that “began as a low key acoustic project”; this new album was very much planned as a full-on symphonic rock album from the get go. It felt we should strike while the iron was hot so we decided to work on what became The Black Forest, a slightly more heavy and dark album. It is both a harder rockin’ album and also more symphonic; we’ve included more classical influences and dramatic sounds from pipe organ and choirs. I was thinking in terms of a classic Alfred Hitchcock movie, like black & white movie and lots of shadows to create more drama. We live in a time of uncertainty; there are all sorts of threats lurking out there. This beautiful blue planet is also a scary place where we see wars, greed, famine, incurable deceases, and religious, environmental, and economical turbulence reign the world. We tried to write timeless stories with a cinematic quality. There are good bits of both The Lord of the Rings and more modern Tim Burton style surrealism. With the history of The Flower Kings, in my case, it felt refreshing to write music that had a bit of a darker edge and more melodrama. How would you say the music of AOM differs from your other projects (Flower Kings, Transatlantic, etc)? As we stand now, I’d say it is probably just a bit darker and more dramatic; with a different lead singer, it will no doubt sound different, but all the other players leave their mark, too. The Flower Kings has a more upbeat, positive feel, and Transatlantic is the sum of the 4 of us (so obviously it sounds different too). I noticed that you barely sing on the album. While I think Nad does a fine job and helps give the project its own identity, I wonder why you decided to sing less here. Can you discuss why? Well, that’s partly because I felt it should not be too much of a similarity to The Flower Kings sound. Also, I enjoy just playing guitar on stage and letting another frontman handle most of the lead vocals. Nad is an interesting frontman and a natural; he really enjoys being there in the centre and being a bit flamboyant and theatrical. The Flower Kings have a new live album coming out soon (albeit with material from several years ago), but besides that, the last studio album came out in 2007. Do you still consider The Flower Kings to be your main band? Will there be a new studio album in the near future? Well, in fact, the live album Tour Kaputt was released June this year, and it was a live recording from our 2007 tour where we had Pat Mastelotto as guest drummer. I do not know what my “main band” is; I guess many people regard me as the “Flower Kings” guy, but I feel equally at home in Transatlantic and Agents Of Mercy. It’s all fun and all important to me. As for a new Flower Kings album, I can give no info yet – but I won’t deny that there may be activity in 2012. The Flower Kings, at least to me, have a slightly more eccentric, silly, fun, and experimental sound compared to other prog bands of the time (such as Spock’s Beard and Echolyn). Do you agree and can you discuss why? Oh yes, I suppose The Flower Kings is part symphonic rock band, part jam band, [and] part psychedelic pop band. We never restricted ourselves to being just a prog band and who knows—maybe that also stopped us from being hugely successful (people rather like to know exactly what to expect). I liked the way bands like The Beatles and Frank Zappa’s Mothers… were kind of free of musical limits; they just played whatever they liked and that was a thrilling concept for all of us who followed them. How do you view the legacy of The Flower Kings in the history of the genre overall, as well as part of the 1990s resurgence of prog? The Flower Kings was lucky to emerge in a time when the 3rd wave of prog was new, and we, together with bands like Spock’s Beard and Porcupine Tree, were in the forefront. [We] became a raw model for many bands to come. The Flower Kings defined the orchestrated progressive symphonic rock sound (something many younger bands have adopted), and this [sound] can even be heard on later Neal Morse and Spock’s Beard records. What made you decide to become a prog artist? I never decided to be “prog” – I just happened to write music that sounded like “prog.” In fact, that’s how it all started for me in 1974 when I joined Kaipa, my first band. The good thing about prog is that there is so much freedom of expression in writing and playing; there are no real rules. The prog scene has treated me well and I’ve had success, so that’s probably why I’ve stayed true to this genre. I’ve made so many friends among other bands and musicians (people who I respect and admire). I recently saw the More Never Is Enough DVD, and it seems like you guys still perform with a lot of joy, freedom, and spontaneity. At this point in your career, do you still get a lot of pleasure out of performing or does it feel like a job? It never feels like a job; in fact, I think it’s more fun to play these days than it was 20 years ago. [The] Transatlantic tour was a tremendously fun experience; it’s fantastic band chemistry and something I will look forward to every time. With Agents of Mercy, it is always fun, and we enjoy each other’s company both on stage and off stage. We have lots of laughing and tour insanity, but all the musicians are extremely focused and professional at what they do. Any news on a fourth studio album with Transatlantic? I cannot reveal any news yet. Do you have a favorite Flower Kings album? How about a favorite album out of all the ones you’ve released (under any group name)? My favourite albums are: The Flower Kings – Stardust We Are and Unfold the Future; Transatlantic – The Whirlwind; Agents of Mercy – The Black Forest. Any plans to work with The Tangent again? No plans at the moment, but I’d never say never. We’re still on friendly terms. You’ve work with Jonas Reingold in several projects over the years. How did you two meet and what makes you want to work together so often? Jonas was brought in to TFK as a bass player by our drummer at the time, Jaime Salazar, in 1999. Jonas is very easy to work with and we fill in each others blanks. He is someone you can always trust; he is the guy with the education, and he is sometimes clinical in his approach; I’m the uneducated one so I truth [other’s] intuition and feelings when making music. What’s next for Roine Stolt in 2011/2012? Right now I’m writing music for 2 different projects, and I’m looking forward to a few more interesting projects for 2012. What are some of your favorite albums? Which influenced you the most? Over the years, I remember being influenced by The Beatles’ [The Beatles] “White Album,” Procol Harum’s Shine Of Brightly, Yes’ Tales From Topographic Oceans, Genesis’ The Lamb Lies Down On Broadway, Joni Mitchell’s Travelogue,Vangelis’ Mythodea, Burt Bacharach & Elvis Costello’s Painted From Memory, U2’s How to Dismantle an Atomic Bomb, etc. What are some of your favorite songs to play live? Why? “The Whirlwind” by Transatlantic, “The Truth will Set You Free” by The Flower Kings, “Korståg” by Kaipa, “Stardust We Are” by The Flower Kings, and “The Black Forest” by Agents Of Mercy. If you could record/perform with any artist(s), who would it be? Paul McCartney, Joni Mitchell, Jon Anderson, Jackson Browne, Bono, and Jeff Beck. Thanks for taking the time to speak with me, Roine.